Today is Safer Internet Day! This day is dedicated to bringing awareness about internet safety to parents, teachers, and students. The internet continues to become a more dangerous place if it is not used correctly. Students need to continue to improve their digital citizenship skills in order to make good decisions when they are online. Take Safer Internet Day as a good opportunity to remind students to be safe when they are online. This website aims to showcase the many exciting activities and events that will be taking part across the globe to celebrate the day. 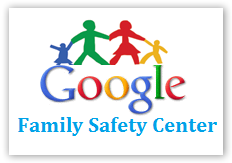 The Google Family Safety Center introduces parents to and shows them how to use Google's safety tools including safe search, safe search lock, and YouTube's safety mode. Google has partnered with a number of child safety organizations to develop educational materials for dealing with topics like cyberbullying, strangers online, protecting personal information, and avoiding malware online. Finally, Google's Family Safety Center contains a collection of videos featuring Google employees sharing the strategies they use with their own kids for teaching online behavior and keeping their kids safe online. Visit Google's Good to Know: Online Safety Website for tips and advice on how to stay more secure on the web.